Call me a scrooge if you must, but I don't really buy into the whole Valentine's thing that much anymore. And anyway, who needs all of those added extras when there are lovely companies out there, like TanOrganic who make the very kind decision to treat me to a lovely, luxurious box of Valentine's Day chocolates. It just gets better and better doesn't it! As the name suggests, TanOrganic are an all natural, all organic brand who specifically make self-tanning products designed for people who crave a natural-looking, buildable tan but also want to have moisturised, nourished skin. I've heard (and seen the orange faced results of) my fair share of streaky-body-horror-stories to put me off of it for a lifetime, and having a Grandad born in the West Indies, I'm lucky enough to have a complexion just the right side of not needing to fake tan so I have never bothered with it before. But after suffering our brilliant British winter, consisting of months - and months - of freezing cold, snowy temperatures, it has meant that I have definitely felt the need for a little bit of a skin pick me up recently. So when I received this product I just couldn't wait to give it a whirl. I followed the instructions to the letter, and applied a few sprinkles of the tan onto a tanning mitt and rubbed it across my legs in circular motions, trying to get the oil as evenly distributed as possible. Novice or not, I do know that traditionally, tan is supposed to smell all distinctively nasty and very much like biscuits isn't it - or so I have heard anyway - but this oil was none of these things at all. It is a fairly clear in colour and doesn't smell horrible at all - in fact it doesn't even have much of a scent, and the little bit that it does have isn't horrible in the slightest. 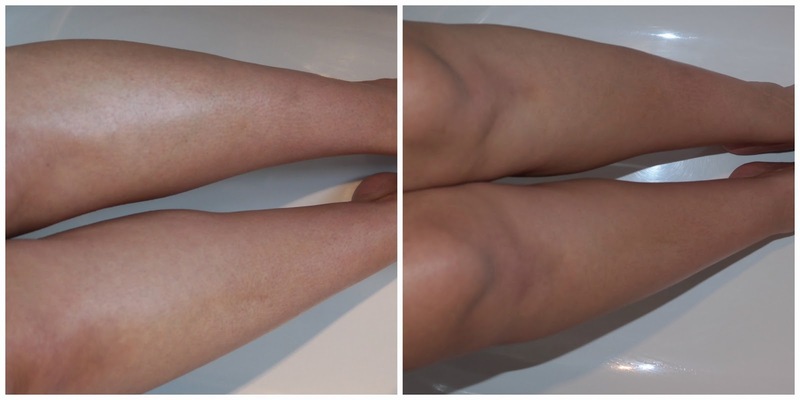 ...and when I woke up I had legs that were really very smooth and fairly silky to the touch (thanks to the exfoliator/oil combo) and they were ever so slightly darker in colour. I personally don't think I applied enough of the product for there to be a huge difference though. But with this being my first ever self-tan experience I didn't want to risk having legs mis-matched in colour to the rest of my body but now I know what I'm doing I'm going to add another layer of the oil this evening to darken the effect a little more. On the whole, I was really pleased with the product. ...but for giving me summer ready legs in the middle of winter! I know everyone complains about the 'biscuit' smell of tanning products.... but I love the small of biscuits?